Progress Measurement System plays an important part of project control. It includes the detail progress tracking sheet of its WBS elements, work categories and work steps for each deliverable. It is developed either when the additional requirements are occurred for a particular project or when progress measurement system is not in placed. The WBS can be decomposed according to above scope. Based on the above WBS level, the status of project deliverables can be tracked and monitored. Overall project progress status is calculated by the sum of weight progress of each WBS element. Note: The estimated man hours are illustration purpose only in order to calculate the weightage of each WBS element. The estimated man hour is calculated based on productivity rate and estimated work quantity from their hierarchical levels. The productivity rate would be different depending on project nature and geographical location. Copy “Progress summary by Project Area table” of each discipline and paste it into a worksheet. 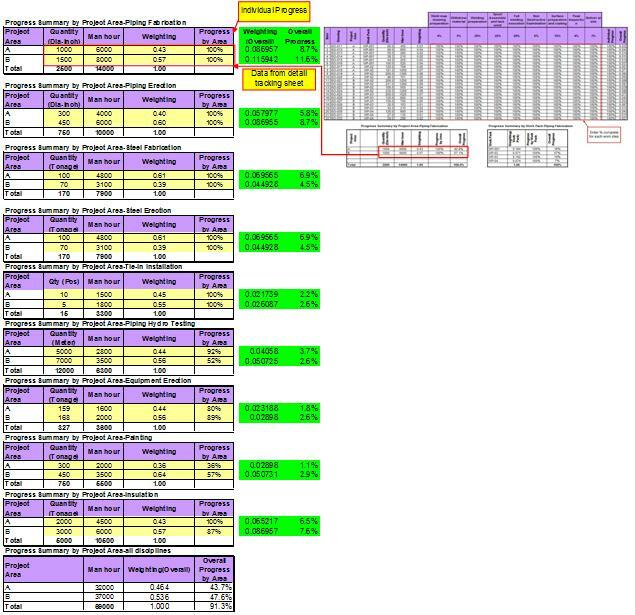 In put data from tracking sheet to summary sheet by paste link; Go to Copy data from each tracking sheet as Yellow shading area >> Paste special >> Paste link at overall progress summary sheet. ( OR) You may integrate all tracking sheets and Overall progess summary sheet into one file if you can play with excel. Paste link method is used to get data update automatically for this post. Insert the column name” Weighting (overall)” and “Overall Progress” as described Green hatching area. Overall weighting of each discipline and area is calculated from man hour of that area and construction discipline by total project man hour. Overall progress of each discipline and area is derived from individual progress x overall weighting of that particular area and discipline. Sum up overall progress described on item 5), finally, you will get overall progress for all disciplines and areas. See figure below. Excellent work Min. Keep up the good work.